DELETE – Delete an object. DETAIL – Provide details about an object. EXTEND – Extend a volume. GPT – Assigns attributes to the selected GPT partition. HELP – Prints a list of commands. IMPORT – Imports a disk group. INACTIVE – Marks the current basic partition as inactive. LIST – Prints out a list of objects. ONLINE – Online a disk that is currently marked as offline. REM – Does nothing. Used to comment scripts. REMOVE – Remove a drive letter or mount point assignment. REPAIR – Repairs a RAID-5 volume with a failed member. RESCAN – Rescan the computer looking for disks and volumes. RETAIN – Place a retained partition under a simple volume. SELECT – Move the focus to an object. DiskPart successfully created the volume. The arguments you specified for this command are not valid. Volume 2 is the selected volume. DiskPart could not assign the drive letter or mount point. Make sure the drive letter or mount point is valid. ADD – Add a mirror to a simple volume. ACTIVE – Marks the current basic partition as active. ASSIGN – Assign a drive letter or mount point to the selected volume. 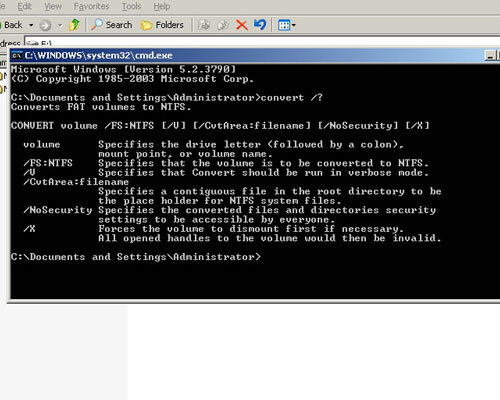 AUTOMOUNT – Enables and disables automatic mounting of basic volumes. BREAK – Break a mirror set. CONVERT – Converts between different disk formats. CREATE – Create a volume or partition. DiskPart succeeded in adding a mirror to the volume. Volume 3 is the selected volume. DiskPart successfully extended the volume. BASIC – Convert a disk from dynamic to basic. DYNAMIC – Convert a disk from basic to dynamic. GPT – Convert a disk from MBR to GPT. MBR – Convert a disk from GPT to MBR. DiskPart successfully deleted the volume.